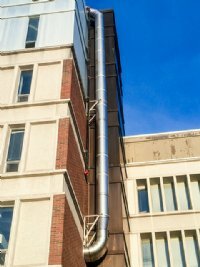 Fume Vent Lab Smart Laboratory Exhaust System. 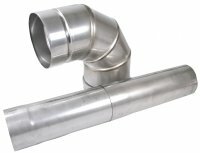 Featuring factory expanded pipe and fitting ends. Fusion welded pipe seams. Fully welded fittings. In diameters from 4 inches to 24 inches. Constructed from: 20 GA Stainless Steel and 304L/316L Stainless Steel. Benefits include: Air and watertight seams. Meets SMACNA RT-6 Standard. Field labour savings. Lab Smart Design. Cut to length on site. Directional exhaust flow. Self supporting connections. For use in: anaesthetic gas scavenging systems, hot lab exhaust, bio-safety cabinets, car wash exhaust.